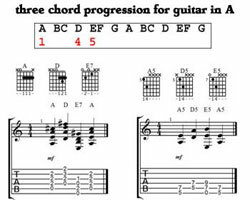 Guitar Chord Progressions -What you need to know. Guitar chord progressions are what make music flow and make sense to the listener. The order of the chords can create emotions. The type of chord adding what some call color. Lighthearted music uses most major chord and music with a heavier mood use the minor chords. Along with many other types of chords, you can span the whole range of emotions. That's what music ideally does - move us emotionally. This site doesn't go into a bunch of music theory. Just enough to explain this. 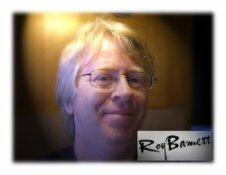 This site is about easy ways to get you playing guitar fast. So with that in mind, I decided not to go into theory very much at all. Just enough to give you a running start. There are excellent resources out there that do a much better job than I could here. so with this in mind lets get on with it. Basic Guitar Chord Progressions Explained Simply. A chord progression is a movement of chords taken from the notes in a scale in a key of your choice or the choice of the songwriter. When we talk about the roman numerals, they symbolize the placement of a chord we are talking in the order that they are in the scale, in any key. The I IV and V chords are usually major. Typical chords in any key. The movement between chords causes a sense of either tension or relief when people hear them. 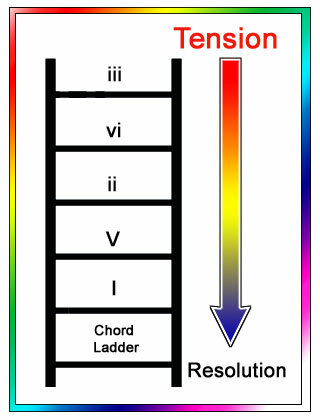 The amount of tension in a chord progressions can be visualized on the chord ladder. How high you climb up the ladder and then fall down to the tonic (that's the one chord) determines the amount of relief from the force of gravity or tension. So you can move up and down and in between the rungs to create the flow of the song till you decide to release the tension and go back to the tonic chord. Ta da aaa aah! Chord Substitutions in Chord Progressions. 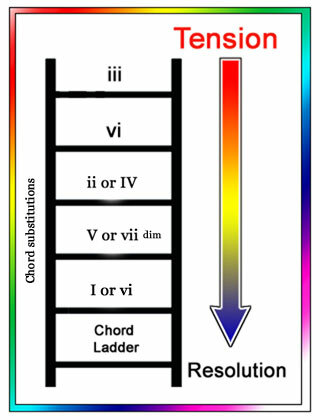 This chord ladder shows the chord substitutions. 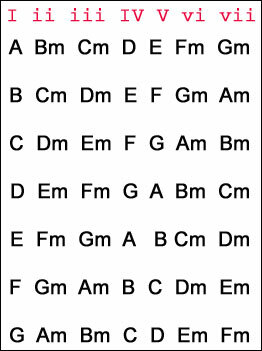 These chords can be substituted for the others because they share a majority of notes. That seven should be diminished. It's your pick, experiment and have fun. What basic chord progression has made more fortunes, stars and hits than any other?